A LOCKERBIE woman is being hailed as an example to other potential apprentices. 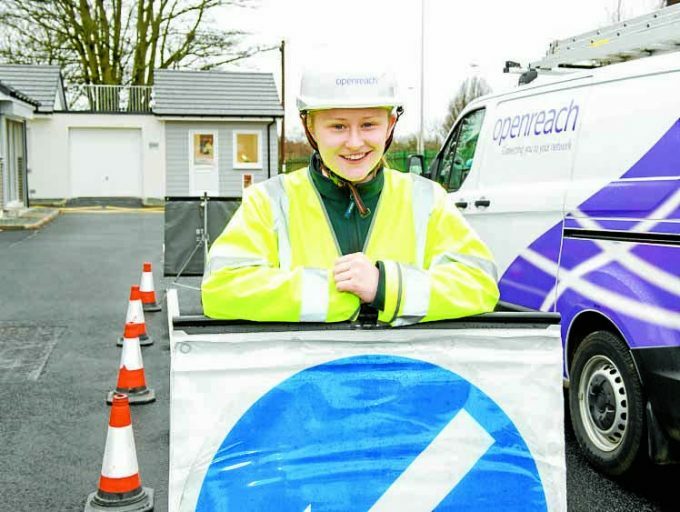 Elaine MacEachern, 20, is a trainee engineer with Openreach and is taking part in their current campaign to highlight the benefit of apprenticeships. Despite being born profoundly deaf, she is excelling in her training since joining the organisation last November. Elaine went into engineering following a career in motorsport. She said: “I started racing motocross at the age of nine nationally and won the Girls British Championship twice. I finished a best result of seventh in the Women’s World Championships. When I left school at 17 I started studying in the fitness industry, but an opportunity arose to race in the Women’s World Motocross Championships, this meant full time commitment to my training, travelling and racing. I raced as far as Indonesia, and in Europe.” “Unfortunate circumstances” put an end to her racing career and she switched to engineering, because she’s practical and loves to be on the go. With Openreach, she is responsible for providing and repairing customers’ telephone and broadband.